Small boutique web design business based in New Zealand but working internationally. All round skills in digital art and design - image and sound. Specialty: professional portfolio sites for artists, musicians, writers, performers, film makers, crafters, creative people, and small businesses of any denomination. Eight years experience running www.asni.net - website and online shop to promote my own artwork and music. We write our own customizable html/css and php code. No mucking around with Wordpad or WYSIWIG editors - though we do use Dreamweaver to make the coding process more efficient - as well as Flash, Photoshop, Illustrator, Lightwave 3D, Premiere Pro and AfterFX if needed. Additional design and artistic services available: illustration, 2D and 3D graphics and logos, photography, image editing and optimization for web, video production for web, animation, sound editing, advice with online promotion strategies for artists. Overnight work available due to time zone offset with Europe and US! 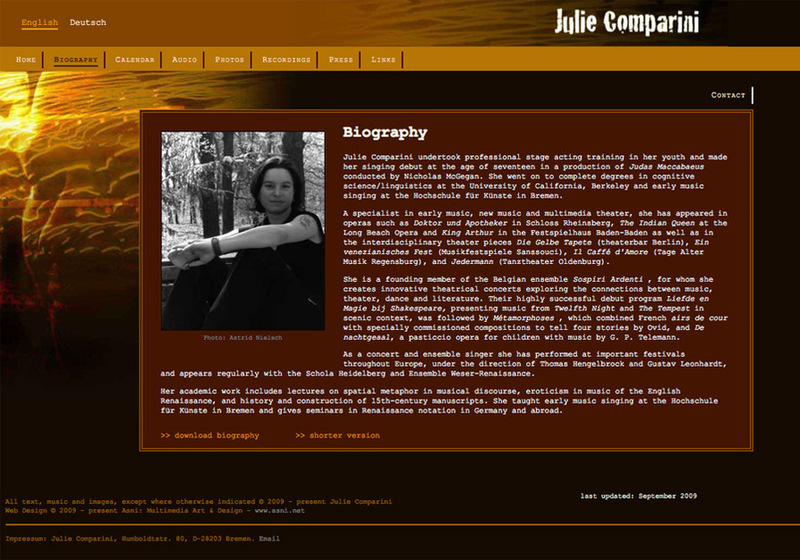 Screenshot of the "biography" section, http://www.juliecomparini.com - professional portfolio website of Julie Comparini, a singer specializing in early music and contemporary multidisciplinary theatre projects.